Well this is probably the last post on this side of the holidays. I am writing by fairy lights – standing up in my living room. The wind is howling outside. I suppose it’s too much to ask for to see some nice white stuff in the AM. Maybe in 2015? My friend told me to check out a new TV show called The Red Band Society. I had no idea what it was but I did follow up her recommendation. It’s an interesting show about kids (teenagers) in a hospital and the highs and lows of their incarceration by disease. It boasts a good cast of young actors and a few familiar faces too – not to mention a pretty stellar soundtrack on each of the episodes I’ve seen thus far. Strange how many shows there seem to be about illness – in particular Cancer: ‘The Big C’ for one – ‘Chasing Life’ for another. In any event, it’s worth a watch if you’re into that sort of thing. Good family drama as it were. It’s been a challenging week on the Younique By Thea front. Not with my own stuff but with my team’s. One in particular has been very unlucky on the Younique front, but she’s also sold more mascara then the rest of our “company” combined. 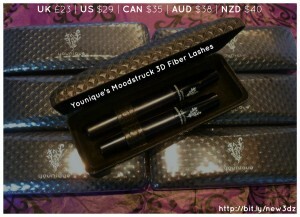 Thankfully I stocked up on these lovely 3D Fiber Lash Mascaras as I suspected they’d be “in demand” if not from my own circles than my team’s. Good thing I did. All just about appear to be spoken for. To help my Younique business, I’ve been the process of reading a variety of books on Direct Marketing and Selling. Things like ‘Go Pro’ by Eric Worre and ‘Duct Tape Selling’ by John Jantsch. There are so many great resources out there from other, Black Status especially, Younique presenters – so learning what I can from them too. But I think what attracts me most to Younique, beyond getting paid daily, playing with great makeup etc – is its flexibility. In other words what works for one Younique presenter won’t necessarily work for others. Next post My Go Pro Hero Joy!